Many foods produced on an industrial scale include raw ingredients mixed together in enormous stainless steel machines that can be difficult to clean. With repeated use, equipment surfaces get minute scratches and grooves, providing bacteria and biofilms the perfect place to hide. While surface scratches may appear small to the naked eye, they are like a canyon to bacteria, which are only a few micrometers in size. Surface-trapped food residue and bacteria then increase the risk of contamination from microorganisms such as Salmonella, Listeria and E. coli. Professor Ben Hatton of the University of Toronto's Department of Materials Science & Engineering, Dr. Dalal Asker and Dr. Tarek Awad research cheaper, safer and more effective ways to prevent bacteria thriving inside these machines. This minimizes the risk of cross contamination, which can lead to food-borne disease. Their team have proposed a simple new solution: trapping a thin layer of cooking oil at the metal surface to fill in microscopic scrapes, cracks and fissures and create a barrier to bacterial attachment. They found that this solution resulted in a 1,000x reduction in bacterial levels inside the industrial machines tested. Their work is recently published in the journal ACS Applied Materials & Interfaces. "Coating a stainless steel surface with an everyday cooking oil has proven remarkably effective in repelling bacteria," says Hatton who collaborated on the project with AGRI-NEO, an Ontario seed processing company looking for a solution to a common problem in its industry. "The oil fills in the cracks, creates a hydrophobic layer and acts as a barrier to contaminants on the surface." 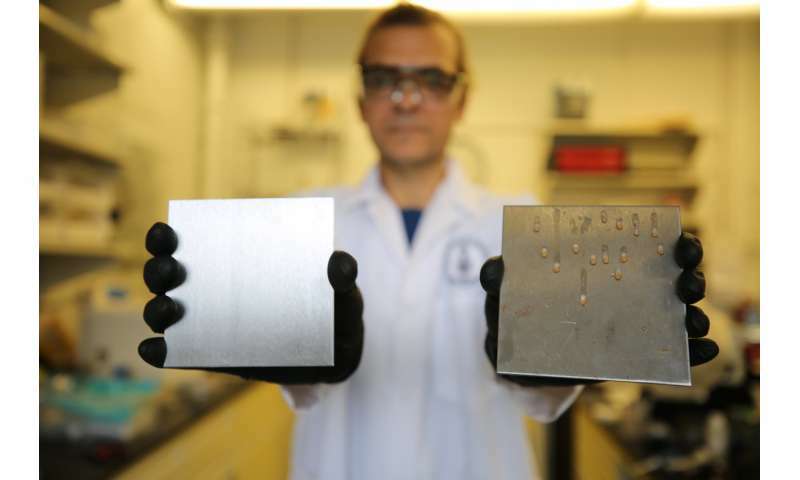 This simple and cost-effective alternative builds on the Slippery Liquid-Infused Porous Surfaces (SLIPS) principle, initially developed at Harvard to trap lubricant layers into a surface microstructure and create slippery, non-wetting and non-adhesive properties. Cooking oils such as olive, corn or canola also provide a safer option for cleaning food-processing equipment than the harsh chemicals and disinfectants that are typically used. The sheer size of the machines makes it harder for cleaning materials to do a thorough job, and leftover bacteria can build up resistance to the cleaning agents. Hatton's method of filling the scratches with oil prevents bacteria from settling and essentially cleans the surface without leaving chemical residues on the stainless steel surface. "Contamination in food preparation equipment can impact individual health, cause costly product recalls and can still result after chemical-based cleaning occurs," says Hatton. "The research showed that using a surface treatment and a cooking oil barrier provides greater coverage and results in 1,000 less bacteria roaming around." The Hatton research group continues to test new combinations of oils, foods and biofilm types to increase the efficiency of the bacteria barriers. They will also explore options of using this method in developing countries to minimize bacterial infection and improve mortality rates. Food safety: Are the sniff test, the five-second rule and rare burgers safe? They discovered the method for seasoning cast iron pans? The seasoning of cast iron cookware is done to create a non stick surface. It was never intended to be a bacterial repellent. Everything what this study actually demonstrated is, that lubricated surface repels water. Who would think of that? Oiled surface will collect dust and bacteria spores instead. Bacteria need two things: a surface to stick to, and water to live. Coating the surface in oil reduces both water retention and adhesion for the bacteria, so even if they manage to stick around they dry up and die. But this is not an universal solution, since oils become soap if you add acid or base, which means a ketchup factory won't find this method too useful - vinegar washes the oil away. Yes. Isn't it just amazing. How great is Science to discover something that my mom and grandmother have done most of their lives. Coating Cast iron AND that newfangled stainless steel. Put the oiled pan under a sunlamp and the spores will think they are at the beach. And the levels of BT pesticide in the cooking oil are? "450 people in the US die from falling out of their beds each year"
Now compare that with known number of deaths from BT pesticide poisoning from eating edible oils by googling that and the indications are it is probably virtually nil. So should we ban beds? The various perceived risks from the public are often wildly at odds with the actual risks. I wonder if this is related in any way to why animals produce oil on their skin? If so, the more pressing question is: how are they cleaning them now? If you're already assuming the equipment is built poorly and doesn't pass FDA regulations, then of course you'll find it difficult to apply -ANY- sanitation method whatsoever. Machines making pasties jam tarts have tubes with jam in or pasty mix - it is impossible to apply oil and it will not stick, most of the time there using the constant flow of fresh mix to keep the tubes clean, the bread mixers just clean everything of the aluminium into the dough, some machines collect the excess cream and reuse think about that point on its own, microbes do! Imagine my surprise when I went to mix a vinaigrette for my salad and out came a blob of soap. Oh, wait, no, that didn't happen. humy wrote: "450 people in the US die from falling out of their beds each year" I would like to have a better source for that. If true, how many of those involve both falling out of bed and some other condition and not just the fall? How many are children or others in upper bunks? I'm not saying it's bunk (pun intended), but I suspect it's often more than just falling on one's head. That's right. The oils turn to soaps at high PH, not low, but the Edit button was long gone by the time I remembered that.